Competitive fencing is nothing like swashbuckling or the swordplay you see in the movies. There are long periods of deliberate, measured, uneventful maneuvering until somebody sees an opening and lunges. Bam. It’s usually over before the buzzer stops buzzing. The VP debate last night reminded me of all the fencing matches I competed in, and usually lost badly. Both Ryan and Biden chose their words carefully, circled each other strategically, and looked for an opening which never really came. Like a fencing match, it was terribly boring to watch – long periods of nothing with only an occasional lunge or parry. Both men made an equal number of attacks, and both successfully parried throughout the evening. No buzzer. No hit. No great, memorable “You’re no Jack Kennedy” moments. If I noticed any real differences, it was in their choice of weapons. Ryan fought with a foil, the lightest and most precise of fencing weapons. He went after specific targets, attempting to hit Biden in vital areas that would kill a man if it were a real duel. I’m not sure any blows struck with much effect, but it did require Biden to respond in kind. More importantly, it showed that Ryan would not be toyed with. Its like those scenes in the movies where the two antagonists try a few probing lunges and jabs to establish their prowess with the blade. Ryan wanted to show he could fight. He succeeded. Biden chose a much heavier weapon, the saber. The saber is designed for slashing and hacking, and taking off a man’s arms and legs. Its designed to maim rather than inflict a swift death. Biden continually tried to break Ryan’s concentration with a series of feints in the form of guffaws, chuckles, exasperation, and interruptions. He wasnt trying to refute anything in particular. He was executing a strategy to get Ryan off his game, make him drop his defenses, and create an opening. Biden was hoping that Ryan would lose his cool, get angry, get flustered and say something silly. The intent was to inflict damage on the Romney/Ryan brand so people could say “Ryan’s not yet ready to be President. He’s too young. Come back in a few years young man.” But Ryan didn’t take the bait. His discipline and training prevailed. It was like a scene from Return of the Jedi, with an evil Emperor Biden saying through rotted teeth “Take your weapon and strike me down. I feel the hatred within you.” But Ryan, master of his own emotions, passed the test. Fencing is a boring sport. For that matter so is politics. They only become interesting when somebody gets hit. Last night was a draw with few fireworks and little blood. The competitors have left the arena, but left their weapons on the floor for Tuesday night. Will Obama pick up Ryan’s weapon, and Romney Biden’s? Congrats on getting on freshly pressed. I hope I get there some day. Fencing? Boring? For shame! I’m a formerly nationally ranked saber fencer and (as you know) American women are now tops in that Olympic sport. Epee, yes, boring. Foil, yes. Saber? Never! Touché. Saber was always the most fun. As a (predominantly) epee fencer, I’m afraid I have to disagree with it being boring! I’m not sure why there still has to be such resistance between the weapons, they are all great fun. I agree with you, though a foil fencer I enjoy both epee and sabre (watching, mind you, not fencing). As a former foilist, I disagree. Foil is never boring – except maybe from the outside, sometimes. But saber is also amazingly FUN. Epee, yeah, that is boring from both the inside and out. 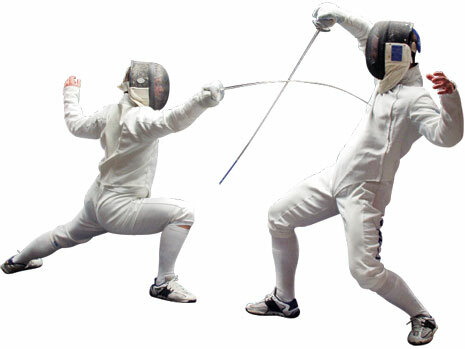 Epee is the only discipline in fencing that can be considered a sport. Technique, tactics and stamina = real fencing, Foil gets close but is suitable for kids who can then move to epee. Sabre… please. Seldom more than two seconds from Allez! to Halt! and then most of the time is spent with judges discussing and looking at video replay. I love posts like this. It leaves everyone with something to think about, and doesn’t leave us with a bitter taste in our mouths because of a choice you made. You kept it neutral and analytical. Something that is kind of hard to do when discussing politics. Something that I try to avoid online as much as possible. Great post! I love the analogy and analysis. Thanks for sharing! Whilst fencing may be “boring” when you start, once you have gained the required skills it is a wonderful sport. Not much is fun whilst you’re a beginner and always being beaten, but when you get better it is fantastic and a FAR cry from boring! Proabably still really boring to watch. 😛 I have watched enough fencing in my time… To a non-fencer it all looks the same. Nice insight into the debate. I like the way that you made the comparison to fencing. Winners are chosen by virtue of specific rules. There cannot, in the end, be a draw between what is evil and what is pure. America is looking at this war of words with a microscope. When what is needed is a view from God’s perspective. From that vantage point a simple skirmish was fought. The real battle is fought among armies divided by distance but not loyalty. I watched fencing on purpose for the first time during the last Olympics and found it pretty interesting. The debates, however, are definitely boring. It would be a lot more interesting if any of the moderators were willing to pin down the candidates with difficult questions and not let them get away with performing flashy word tricks and making equivocal statements to throw us off. Using the good old “pivot” is the sign of a great debater. You don’t want to answer that specific question about the economy? Pivot your story into a tale about the young Marine you met who wanted to get a good education. Of course, the audience loves the tale and gets a warm feeling not realizing they were never given an answer. “I have no idea what your story was about but can you answer my question?” is what should come from the moderators’ mouth but nope…they let the show go on. Anyway, great post and congrats on being “Freshly Pressed”! Maybe fencing if boring for you, but for others to watch especially the fencing at the Olympics, to me it was very very exciting! I love the fencing comparison. I took two semesters of fencing, first foil, then epee. Great sport. I agree with other posters that it’s anything but boring. I don’t miss the bruises all down the right side of my body, but I do miss the sport. I didn’t see the debate, but I love your analogy! I fenced for a few years – foil was my first love, sabre only in summer as that was all that was available! I love the precision of the foil. Enjoyed how you parried your words! Great use of metaphor, even if it reads like some of the readers did not get your use of wit. I only watched part of the debate. Read about more, but I enjoyed your discussion of it much more than I would have enjoyed watching it. Or, worse, reading some journalist with an agenda write about it …. What I did see, fit in with your description. Nice way of describing politics! Very interesting to read. I fell in love with fencing during the London Games this summer..such an intense, elegant sport. Fantastic post, thanks for sharing!! Congrats on being Freshly Pressed!! Hopefully Obama shows up with a better weapon tonight than sullen resignation. Great analogy of a post! Truly deserved it’s freshly pressed. Now that Obama has been re-elected (and has nothing to lose) so you think he will he use some of the other weapons in the arsenal? What’re you expecting? Yet another kind of bonus could be the variable benefit, this means you gat a clear percent from the sum people deposit. The percentage is different for just about every site – it might be 20% or perhaps 50%. Some casinos even offer a 100% casino bonus. This can be a way to get people the government financial aid the virtual game suites, but an online casino bonus means you have to play simply by some guidelines especially if you want to redraw your money. This will be difficult because after you get an online casino bonus you will need to meet some conditions which might be not without difficulty accomplished. However, your efforts will likely be rewarded.